Saturday December 20th 1924 I was busy all forenoon. I cleaned up my room and did some writing. Letters to Mattie Fletcher and Winnie Laurence and cards to Frank Woolf and Henley Allen. Fannie and I rode to town in a taxi after dinner. Did some shopping. I sent package to Winnie and Ida for all of them. Ott had the car ready and brought us home and we rode out to the end of paving. very cold. Sunday December 21st 1924 It was very cold. Ott could not start the car and walked to church. I finished and packed bead bag for Nellie McCall. Fannie had company for dinner, a couple of ladies from Marshalltown. In the evening I wrote to William & Mary, Roxie Roboneau, Fern Briggs, Edith Whetstone and Mary Mary Halson. Dr Prentiss and Biddy called. 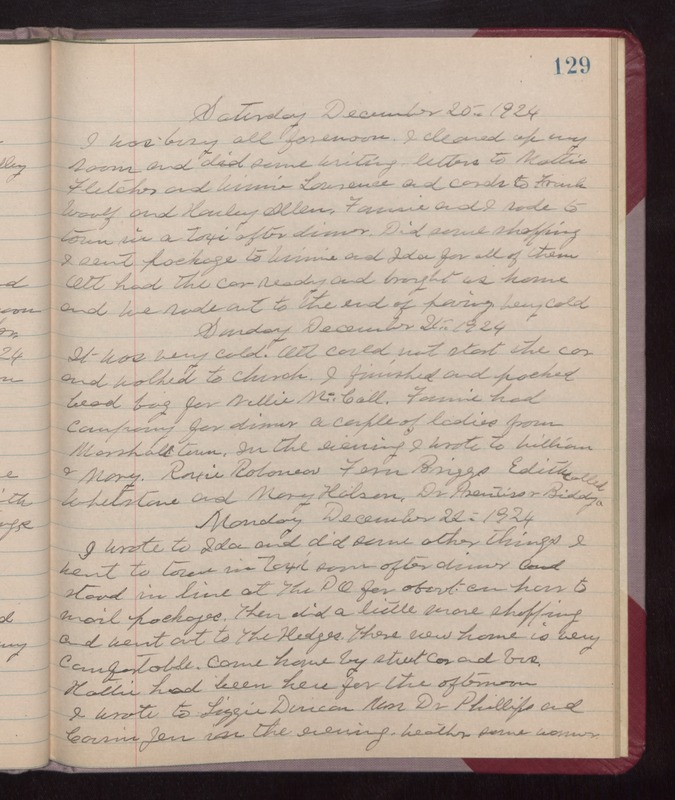 Monday December 22nd 1924 I wrote to Ida and did some other things. I went to town in taxi soon after dinner and stood in line at the PO for about an hour to mail packages. Then did a little more shopping and went out to The Hedges. There new home is very comfortable. Came home by street car and bus. Hattie had been here for the afternoon. I wrote to Lizzie Duncan, Mrs Dr Phillips and Cousin Jen in the evening. weather some warmer.